Foot stomping enthusiasm...communities who are fed-up with ANC are bringing their songs and slogans to the DA. Here is Legislature Leader Bobby Stevenson (middle), at a meeting in Somerset East on Saturday, 16 April. On the left is Genevieve Cannon, councillor of the Ndlambe Municipality in Port Alfred. With the Legislature now in recess in the run-up to the May 18 municipal election the political temperature has begun to rise in the province. More and more people from all communities are joining the DA as the election campaign hots up. These communities bring with them songs and slogans which they adapt to suit the DA. The growing numbers of particularly ANC supporters who are now coming across to the Democratic Alliance has clearly irked ANC provincial spokesperson Mlibo Qoboshiyane, who last week sent a statement to the media calling on the DA to “refrain from political plagiarism”. Qoboshiyane said that in a number of occasions the DA had “ventured into political plagiarism by making use of the ANC’s political heritage material like songs, slogans, and even embracing our Freedom Charter in its election campaign”. “Our material, heritage and leaders belong to the ANC not these political groupings… [the DA’s] leader, Helen Zille has, in several instances, wrongfully claimed that their party is the home of Cde Nelson Mandela’s values,” he said. In response, the DA’s point is that there is a new struggle for freedom that is being waged in our province today. It is a struggle for jobs, for service delivery, housing and decent roads and the ANC is failing dismally in this regard. The voters of this province are clearly catching on to the fact that the DA delivers on these issues. The DA does not just talk about a better life for all. We deliver one. This is because where the DA governs, the DA governs well and delivers services to all the people. People from all communities across this province are joining the DA because they see the DA as the party that can deliver a better life for all, rather than promising one in the hereafter. They bring to our party songs and slogans that epitomises the struggle for new opportunities. The ANC is now panicking as the DA ranks across the province are being boosted by former ANC-supporters. The DA embraces the rainbow vision of Nelson Mandela and believes that, as the Freedom Charter so aptly states, that South Africa belongs to all who live in it, both black and white. South Africa is a much better place after 1994 than it was before. But the ANC has lost its way and does not do enough to stamp out corruption, nepotism and the lack of accountability. These all steal resources that would otherwise be devoted to improving the lives of the poorest of the poor. This is why the DA is at the forefront of the new struggle for a better South Africa. 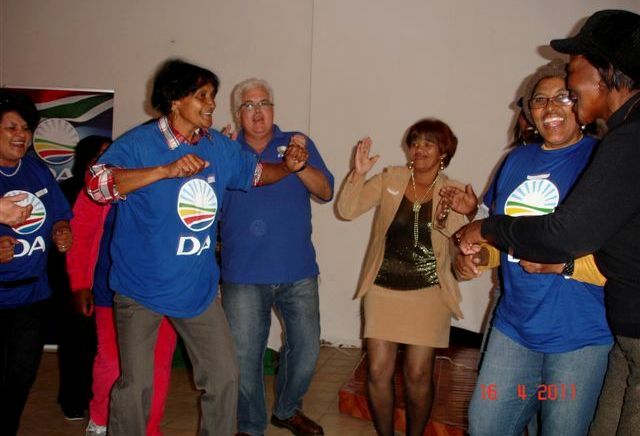 The DA delivers for all the people.